Monica Fee, taking part in the cycle. In the near future Monical will attempt a round Ireland trip in the 'Monica Fee Cycle Against Suicide'. Ebrington Primary School has won through to the finals of the BBC Radio Ulster School Choir Of The Year. They saw off stiff competition in the third round heat staged at Lisneal College, beating choirs from Nazareth House, Long Tower , Castledawson, Ballymena and Ballykeel. Over the course of the next four weeks, choirs from across Northern Ireland will be continuing to sing to impress as they battle it out for a place in the final of the BBC Radio Ulster School Choir Of The Year. 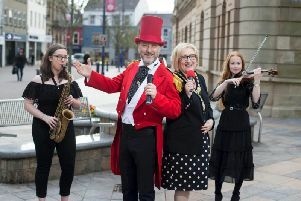 Presented by John Toal and Kerry McLean, and recorded at six venues across Northern Ireland, the third programme was broadcast on Sunday on BBC Radio Ulster at 2pm. The series, part of BBC Music NI, will culminate in a live final from the Ulster Hall on Sunday, April 26. In the senior category, the following schools competed for a place in the grand final: Ballycastle High School; Coleraine High School; St Cecilia’s College; St Mary’s College, and Thornhill College from Londonderry. The programme can be heard on the BBC iplayer.